We provide training which is up to date, informative and fun with the emphasis on practical 'hands on' mixed with high quality presentations and supported by relevant documentation and notes. Our training is designed to use trainees' time as efficiently as possible, thus minimising expensive down time. We draw on our wide range of experience to prepare excellent training sessions. System operation is explained using high quality computer based presentations coupled with work on training rigs. Installation, commissioning, service and maintenance principles are covered in hands on practical sessions using a range of industry standard tools and equipment. Emphasis in all training sessions is on participation by all trainees. We have a state of the art facility equipped with commercially representative training rigs. 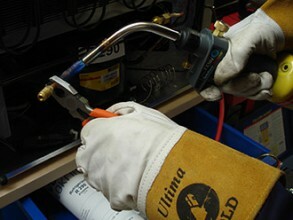 We continually invest in the latest service tools and equipment. Our equipment operates on a range of refrigerants, including R744 (CO2), hydrocarbons (R290, propane) and the latest variants of lower GWP HFCs. Our training room is comfortably furnished, has audio visual equipment and other training aids. We have developed high quality PowerPoint material and videos for our courses. 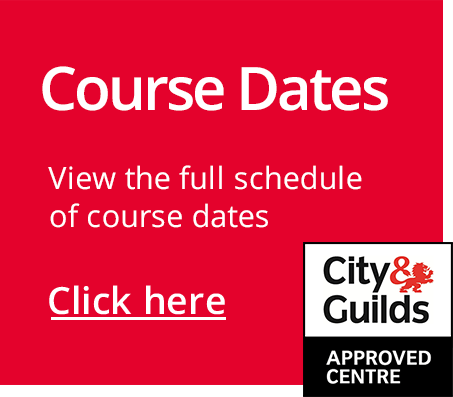 For a full schedule of course dates at our training centre in Gloucestershire click here. Some courses can also be provided at other locations. See below for a short description of each of our standard courses, click on the link to get more detail and remember that most of these courses can be tailored to suit your needs. If what you need is not here, then just ask! This enables a novice to understand how an RAC system works and be able to maintain and service it. This enables an experienced engineer to understand how to safely handle HC and A2L refrigerant during installation, service, maintenance and disposal, and provides an overview of flammable refrigerant system design and application. This course can be provided at your location. This is for experienced engineers and covers safe handling of HC refrigerants during installation, service, maintenance and disposal. It also explains how HC systems are designed and how maximum charge sizes are calculated. The theory and practical C & G 6187-21 HC assessments are included. 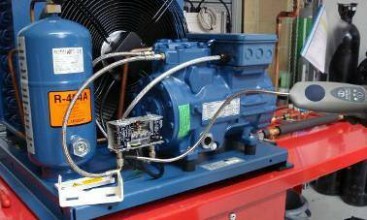 Transcritical and booster systems are included, ranging from condensing units to central plant systems. 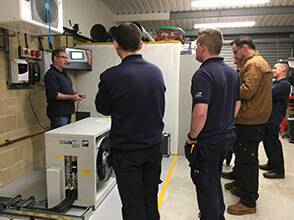 This course is for installers and maintainers of the SCM CUBO2 Smart range of condensing units supplied by Dean & Wood and HRP. It is suitable for anyone who needs to know more about small R744 transcritical systems and how they should be installed and serviced. We assess candidates to the British Refrigeration Association's Brazer scheme, in accordance with EN14276-1:2006+A1:2011 Annex B (Specification and approval of brazing procedures, brazers and brazing operators). This is a practical skills test coupled with a multiple choice assessment to check knowledge about the safety aspects and application of brazing. Training can also be provided. This course can be provided at your location. This practical training session covers very basic electrics, electrical safety, safe isolation (working dead) and component replacement. This session is aimed at maintenance engineers (e.g. case cleaners). The course includes two e-learning RoSPA modules with an assessment at the end of each and a practical assessment. 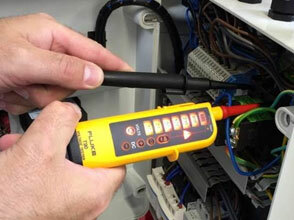 This practical training session covers electrical safety, safe isolation, single and three phase compressor electrics, understanding wiring diagrams, measuring & metering, electrical fault finding and component replacement. This session is aimed at service engineers. The course includes a short assessment at the end of each practical assignment. 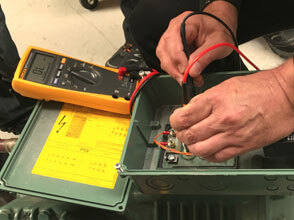 This practical training session covers basic electrical science, electrical safety, safe isolation, single and three phase compressor electrics, understanding simple wiring diagrams, measuring & metering, electrical fault finding and component replacement. This session is aimed at service engineers with little experience. The course includes two e-learning RoSPA modules with an assessment at the end of each and a practical assessment. These are for experienced engineers who do not yet have an F Gas qualification or who have an expiring / expired J11 qualification. Self study notes are sent in advance and the first day is theory and practical revision / demonstration. On the C2 session the theory and practical assessments are on the second day. The C3 session has additional hands on practice on day 2, with the assessment on day 3. We strongly recommend the three day session for anyone who has not handled refrigerant recently. This one day session is for maintenance engineers who carry out leak testing on HCFC and HFC systems as required under the F Gas Regulation. Self study notes are sent in advance and on the day undertake revision and a theory and practical assessment. This is for non-technical people who need a basic understanding of RAC technology and components. It is a mix of theory, practical and discussion sessions with the emphasis on active participation.